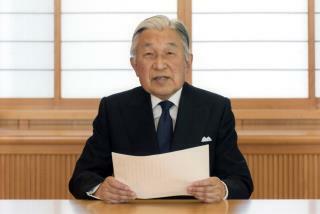 (Newser) – Japanese Emperor Akihito first spoke to his people via video message after the country had been ravaged by an earthquake and tsunami in March 2011, reports Reuters. The second time was Monday, and his words have been just as headline grabbing. In what the Guardian calls "a masterclass in the art of circumlocution," the 82-year-old hinted of his desire to abdicate: "When I consider that my fitness level is gradually declining, I am worried that it may become difficult for me to carry out my duties as the symbol of the state with my whole being, as I have done until now." Such a move hasn't occurred since 1817—predating the country's modern era, which began half-a-century later—and would be complicated. The BBC explains that Akihito "is constitutionally not allowed to make any political statements," which an abdication request could be perceived as. *stabs himself in stomach with a Kenzo Hizori sword. Public Service Announcement: FYI an easy way to dump a girlfriend is to change your Facebook relationship status to "It's Complicated" You're welcome. Years ago. . . . when I first saw this so-called emperor on tv news footage, I was like "Thats the Emperor of Japan??" . . . Guess I was expecting some big tough guy like Ken Watanabe portrayed in the Last Samurai. Not some tiny little physically unimposing goblin-like character.